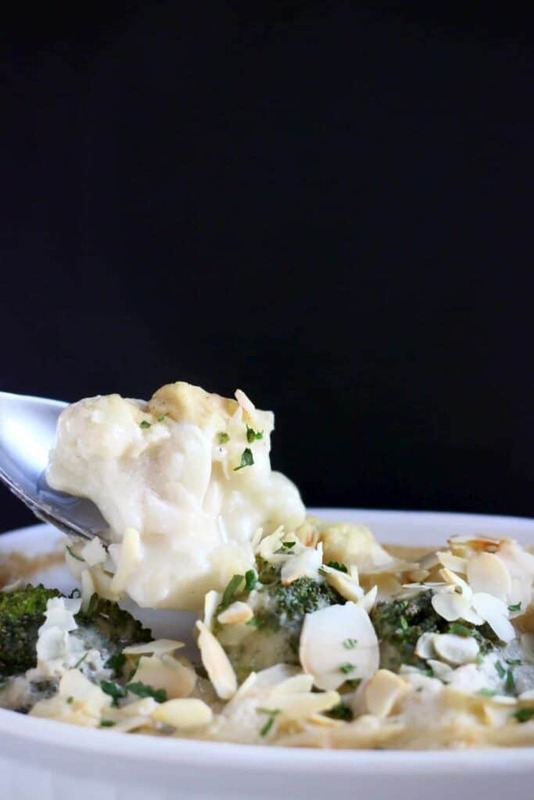 This Vegan Cauliflower Cheese Gratin was inspired by my Potato Dauphinoise Gratin and Scalloped Sweet Potato Gratin – it’s similarly easy to make and tastes just as delicious. 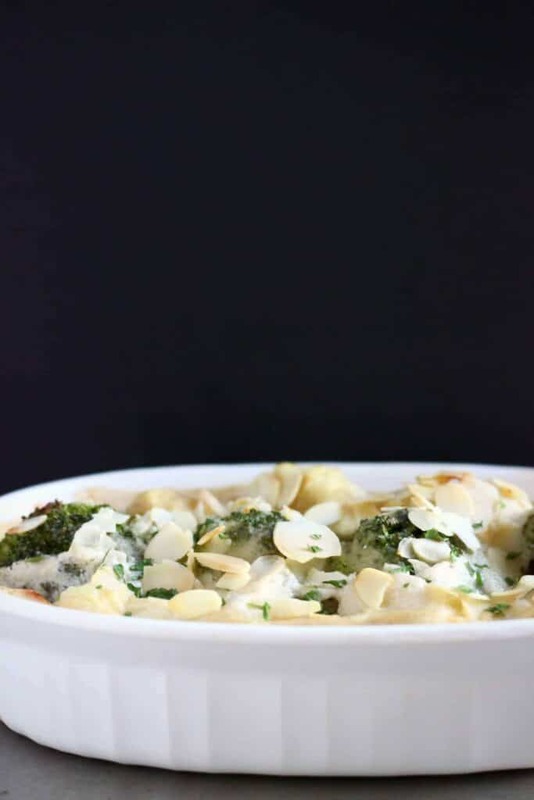 This dish was inspired by one of my childhood favourites cauliflower cheese, but instead of relying solely on a dismal pile of beige, textureless cauliflower, I decided to add some vivid green broccoli to the mix. You could also add other greens such as spinach or kale! 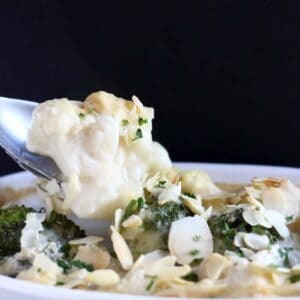 There’s no par boiling required, and the sauce doesn’t require a blender, which makes this dish really easy to throw together. 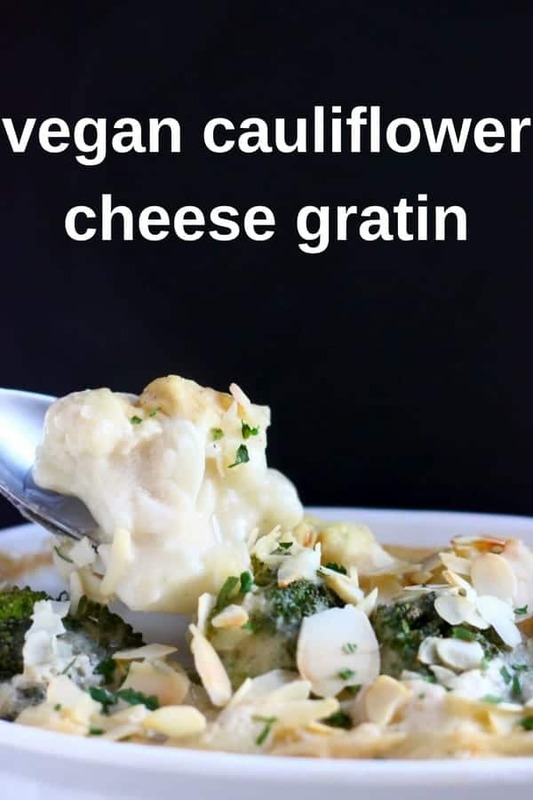 The sauce is made using unsweetened almond milk (or oat milk for a nut-free version), nutritional yeast (for a cheesy flavour), and some basic seasonings. 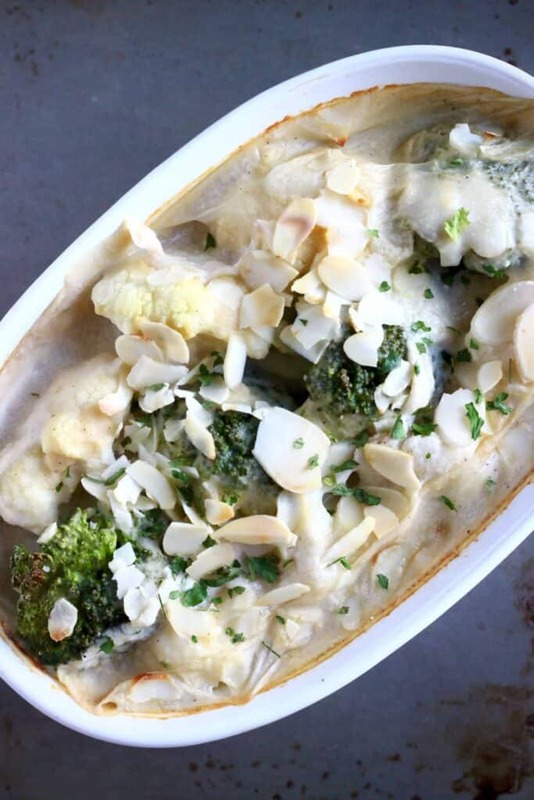 I like to sprinkle this Vegan Cauliflower Cheese Gratin with a flurry of flaked almonds as the sweet, nutty crunch they add is just perfect! 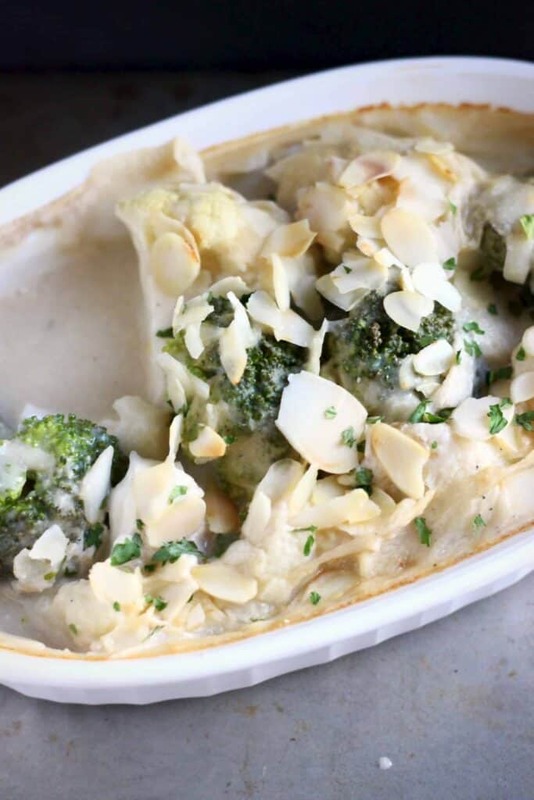 You can cook this gratin for for 30 minutes of 40 minutes, depending on how soft you want the cauliflower and broccoli to be. If you prefer them to have a little bite, bake for 30 minutes, but if you prefer them to be super soft, you should bake it for 40 minutes, or possibly longer. 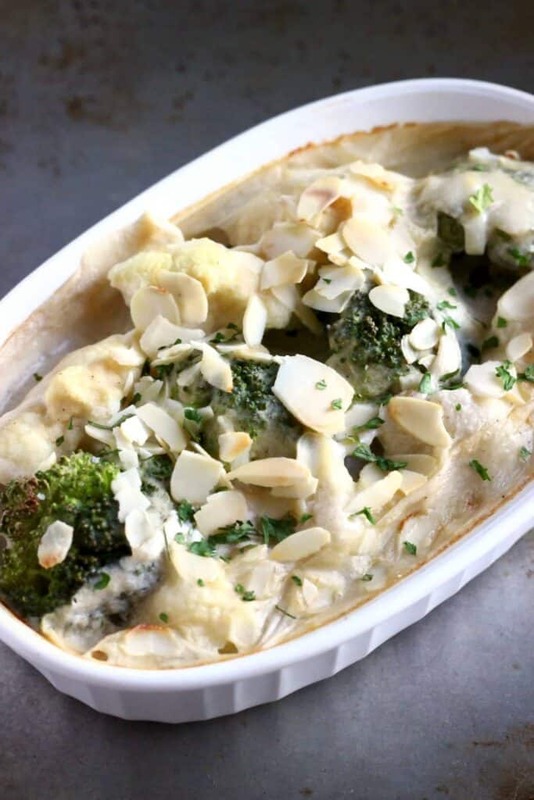 This Vegan Cauliflower Cheese Gratin is going to be one of your favourite side dishes! 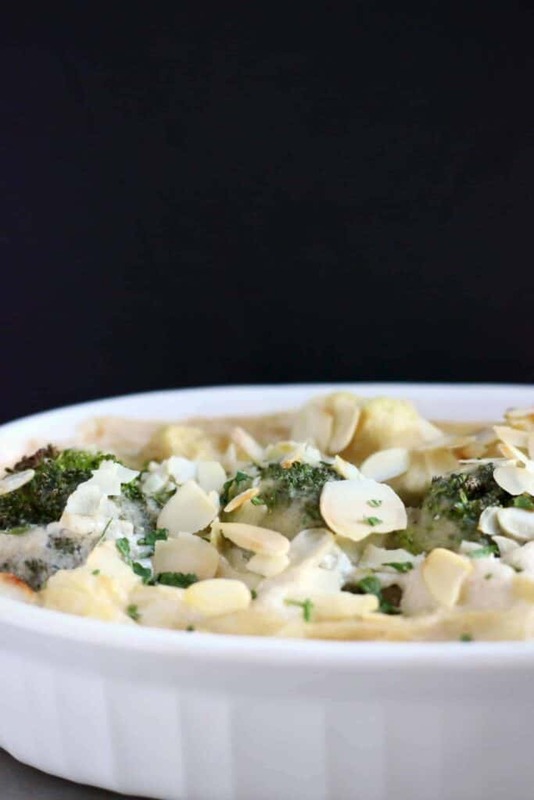 It's rich and creamy, full of flavour and seriously moreish! This was amazing! Made it last night. Making it again tonight! A hit with the the whole family. Thanks so much! Just come across your recipes while searching for vegan, gluten-free food. I notice you use cornflour as a thickener. I cant have corn in any form. Do you know what flour I could use as a substitute, please. Looking forward to getting cooking your recipes. Thank you very much. Thank you! As a thickener for savoury recipes, cornflour can be substituted with rice flour, chickpea flour, tapioca flour or kudzu. Hope that helps! Thank you very much. That’s very helpful.